Japanese developers have no problem including epic clashes between good and evil in their games, even though the idea is a decidedly Western one. 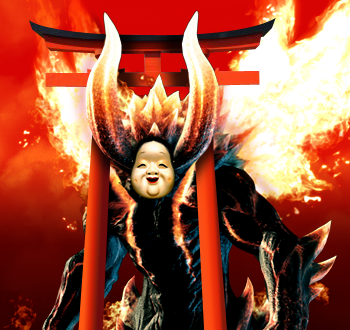 You rarely short of a demon in a Japanese game, and they're usually pretty familiar, too. Japanese developers often seem much happier drawing on Western mythology for adversaries than their own. In Issue 280 of The Escapist, Robert Stoneback discusses some of the reasons behind this strange practice, which are mix of a little bit of pragmatism and a whole lot of history. Much of our civilization is based off the traditions and societies of medieval Christian rulers. They themselves were influenced by the stories of the Bible, one of the cruxes of which is the struggle between good and evil, salvation and damnation. In contrast is Shinto, generally accepted as the oldest belief system of Japan. One of the most important differences between Christianity and Shinto is that Shinto does not focus on the personal relationship between humans and a god and does not have a central dogma for its adherents to follow. An examination of Japan's relationship with Western religions yields some striking similarities to videogame fiction. In the fifteenth and sixteenth centuries, Europe began to set its sights on the Far East. This region was of particular interest to the Catholics, whose religion was undergoing a revival in Europe at this time after losing ground to the Protestant movement ... [M]any Japanese saw them as a foreign culture undermining their way of life. Christian priests and missionaries became associated with dark claims that were much more concerning to Japan than the priests' Devil. Fears of Christians subverting the Japanese government came to a head in 1596, when, in a twist that would feel right at home in a Square Enix game, claims emerged of Japan-based Franciscan monks being used as spies by the Spanish government. This led to six Franciscan missionaries and twenty of their Japanese converts being rounded up and crucified outside of Nagasaki in 1597. It's not hard to see why these years of suspicion and distrust might be mirrored in Japanese media, even centuries later. You can read more about it in Stoneback's article, "The Devil Went Down to Nippon."